Families and groups of up to 12 people who want a luxury home with private beach access. With an isolated location and spectacular views, Palmares Villa makes for an excellent vacation destination for those in search of ultimate comfort and beauty in a private villa. Well-appointed luxury. The villa is fully furnished and decorated with top-of-the-line furnishings. Expansive ocean views. Papagayo Gulf is right outside your doorstep. Beach access. A private path goes from the villa to the beach down the hill. Off-the-grid experience. Palmares Villa is within easy reach of several resort amenities. 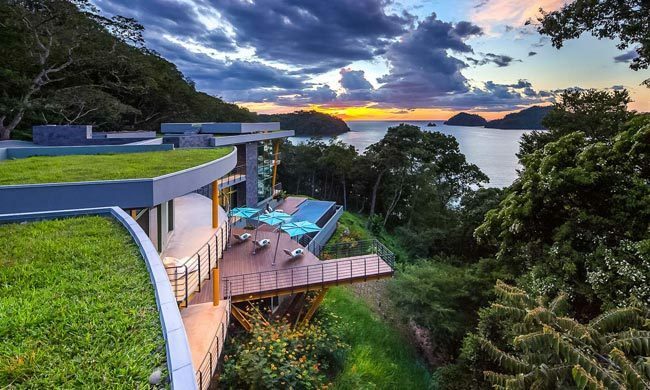 Located in the renowned Papagayo Peninsula in Guanacaste, Palmares Villa is perched on a cliff overlooking the Pacific ocean. The two-floor, five-bedroom house is designed to merge into the geography as much as possible, with green roofs that evoke the surrounding vegetation and large windows that invite the light in. Palmares Villa is designed with many open spaces, featuring the awe-inspiring view of the Papagayo Peninsula and the Pacific Ocean. With clean lines and soft colors, the house is an observatory on the top of the cliff. The construction and large windows create the sensation that you are engulfed by the world outside with all its variety. This same feeling is kept throughout the shared areas and rooms. Their furnishings are luxurious and they are all well-appointed, guaranteeing comfort and relaxation at all times. It’s also a great spot to commune with nature while still enjoying the comforts of modernity. One of its biggest attractions is the deck that hangs over the cliff. Lounge in the sunbeds while admiring the view, or take a dip in the infinity pool for some exercise and a refreshing bath. The deck is connected to a terrace, which doubles as a dining area with built-in BBQ. Spend an afternoon with your group roasting meat, enjoying the view, or sitting in the pool. The flowers down the hill sometimes peek out of the border to greet you, and the trees around the home shade it and attract local wildlife. Keep your eyes open to spot as many birds and lizards as you can. If you want a unique experience with the surroundings, climb to the green roof. It’s covered in grass, and it provides the opportunity to practice yoga, meditation, or simply to enjoy the sunset from a different perspective. Another advantage from this home is its private beach access. Take a quick stroll down to the secluded beach below. The ocean, sand, and rocks are right there for you to enjoy. Go for a morning dip in the mineral water or stay on the cover of the trees with a drink while enjoying the sound of the waves. Palmares Villa is truly a place to recharge and rest with those you love the most. However, if you are in search of adventure, this is the right location as well. There is a variety of options for thrill seekers. Bring out your inner cowboy by going horseback riding, or rush across the trees in a zip lining tour. Nature lovers will enjoy snorkeling and hiking expeditions. Sailing enthusiasts have a marina right on the peninsula for sportfishing. The villa is also within walking distance of certain amenities provided by nearby resorts. There are plenty of restaurants for fine dining options, a golf course, and a tennis course. If you are not sure where to go, ask your Travel Consultant for recommendations. Palmares Villa offers a refreshing side to opulence and seclusion, ideal to get lost in comfort and nature. Enjoy the best of both worlds with this luxury rental in Guanacaste and start planning your Costa Rica vacation today. If you have any questions or would like to get a free quote for your beach getaway, simply contact us and we’ll gladly help! Luxurious amenities, furniture, and state-of-the-art appliances. Private beach and ocean access from the property. An on-site infinity pool, measuring 49 x 9.8 x 9.8 feet. Deck overlooking the ocean with built-in BBQ. Expansive views of the Pacific ocean and great location for sunsets. Media room, ideal to watch TV & play games. Close to other facilities, including tennis courts, golf courses, restaurants, a marina, and adventure activities.